All Seals achieved ISO 9001:2015 and AS9100D certification, the quality standard of the aerospace industry. AS9100 was designed to build upon and enhance the requirements of IS0 9001, the internationally recognized standard for basic quality management, by focusing on the additional, more rigorous expectations and requirements of the aerospace industry. 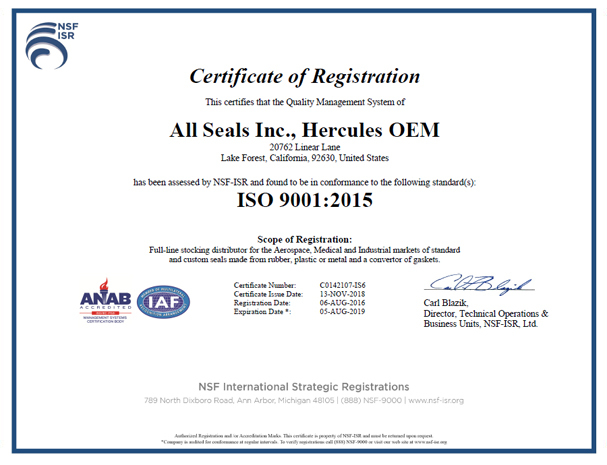 The certification confirms that All Seals possesses an aerospace quality system that is both consistent and robust, ensuring product, process and service safety, reliability and quality. AS9100 certification is rapidly becoming a prerequisite for doing aerospace business, as many original equipment manufacturers will only work with a handful of suppliers, such as All Seals, who are registered to this standard. These quality requirements are extremely important to aerospace OEMs, which maintain high levels of liability for their product quality. A wide assortment of certified compounds are available. UL and NSF Certified compounds are manufactured by RT Dygert. Please contact All Seals for more information regarding UL and NSF Certified compounds.